'Road Rage' Case Highlights Cyclist Vs. Driver Tension Bicycling magazine called it "the road rage incident heard 'round the cycling world." 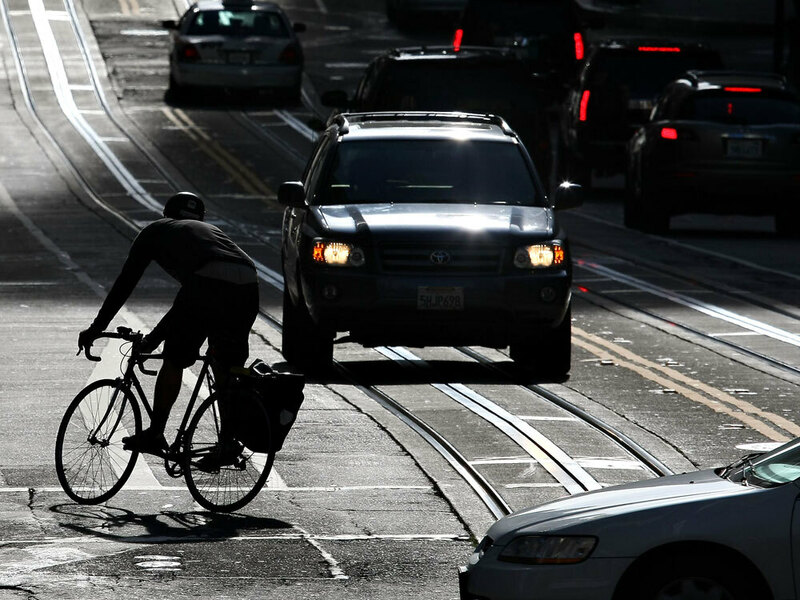 A driver in Los Angeles was recently convicted of using his car as a weapon against two cyclists, who were injured. And the case is focusing attention on the often uneasy relationship between motorists and bicyclists. A bicyclist rides down the street during this year's Bike to Work Day in San Francisco. Events such as this promote biking as a viable form of commuting, but tensions between cyclists and drivers persist. 1. Ride on the road — and the right side of it, too. It's a common misconception that it's safer to cycle on the sidewalk or on the left side of the road. But both practices can confuse pedestrians and drivers, especially at crosswalks when they aren't expecting fast-moving traffic. 2. Lighten up. Don't rely on reflectors alone to light you up if you ride at night. Drivers won't be able to see you in the shadows. Invest in bike lights. 3. Don't hug the curb. If you ride too close to the road's edge, passing cars might sidle you off of it. Aiming for the right tire track of the right lane is generally a safe bet. It happened last year on the Fourth of July, on a steep, narrow road in L.A.'s Mandeville Canyon. Cyclists Christian Stoehr and Ron Peterson were riding side by side when a doctor who lived in the neighborhood came up from behind in a sedan. "There was an exchange of words," Stoehr recalls. "He then accelerated within five feet in front of us, pulled over and slammed on the brakes." Stoehr says there was no time for them to stop. He was thrown over the car and landed across the road. But Peterson didn't have time to swerve. "And he went right in through the back window of the car," says Stoehr, adding that Peterson crashed headfirst. "I think they found his teeth in the back seat." The impact severed Peterson's nose and separated Stoehr's shoulder. Christopher Thomas Thompson, the driver of the car and a former emergency room doctor, was arrested and put on trial. The jury found him guilty of six felonies, including assault with a deadly weapon: his car. Thompson now faces 10 years in prison. "For someone to do this to you on purpose, it's unfathomable," says Peterson, a cycling coach for the University of California, Los Angeles. He says he still can't feel his nose, he now wears false teeth, and he will forever have scars. "I'm happy that justice was served," Peterson told reporters outside the courthouse after the verdict. "I think all of our hope is that this brings to light just how vulnerable cyclists are out there." During the trial, other cyclists told the jury of previous incidents with the driver. And a police officer testified that Thompson said he deliberately slammed on the brakes to "teach the cyclists a lesson." "The road rage was so egregious," says Bicycling editor Loren Mooney. She says this may be a landmark case in protecting cyclists and pedestrians. "It's the intent, the actual road rage, that's part of the conviction in this case." "It's easy for a driver to say, 'Oh, I didn't see you. You're small, you're traveling slowly in the roadway. It was an accident,' " says Mooney. "It takes an enormous amount of evidence to get a conviction of a reckless driver, or in this case, a driver with an intent to hurt somebody with a vehicle." The Mandeville Canyon driver's reaction was perhaps an extreme example of the everyday resentment heard from other motorists. "These bicyclists are extremely rude, and they take up the road — four, five people at a time," complained one caller to NPR member station KPCC's show AirTalk. The caller said he lives in Mandeville Canyon, and he has had it with cyclists. "When you pull up alongside them and ask them to stay out of your way, they yell at you," he said. "They're extremely provocative, they're asking for trouble, and this is not the worst case that's going to happen. Someone's going to get killed, and to be frank with you, the residents aren't going to feel too bad about it." Another Mandeville Canyon resident, Tom Freeman, is sympathetic to vulnerable cyclists. But as president of the homeowners' association, he hears complaints that when drivers try to pass bike riders, "they give them the finger." "If they catch up with them at a stop sign, they'll kick their cars," he says. "Somebody was spit at. It's the few that cause the problems, and they help create a perception." East Hollywood boasts what's known as a "bicycle district," with a bike shop, cafe and bike repair co-op. Here, cycling activist Stephen Box complains that police officers don't take bike crashes seriously. And he says cyclists feel the brunt of car drivers' frustrations. "I've been left-hooked and hit. I've been hit from behind and left in the streets," says Box. "And they expect cyclists to ride where it's unsafe: It's unsafe to ride through potholes in the gutter pan; it's unsafe to ride through broken glass in the gutter pan; it's unsafe to ride in the door zone." His wife, Enci, says that's why cyclists often ride the way they do — to survive, even if that means sometimes running red lights. "When I see the light turn red, I try to race as fast as I can through it," she says, "because I know I will have a block of peace and quiet, where there won't be cars behind me." These cyclists point out that it's actually legal to ride side by side in the streets of L.A. But the rules of the road can be confusing. That's why Alex Thompson wrote what's known as the Cyclists' Bill of Rights. "Cyclists have the right to travel safely and free of fear. We have the right to the full support of the judicial system," says Thompson, a bike blogger who also co-founded the L.A. bike cooperative Bikerowave. "These are all rights cyclists already have, but we need to reaffirm these." "Oh, we hate these guys," says Rogers. "We absolutely hate them. The driver you tick off is the one who's going to run me off the road."